When it comes to your taxes, mistakes can cost you. That’s why it’s smart to hire an expert at tax time. 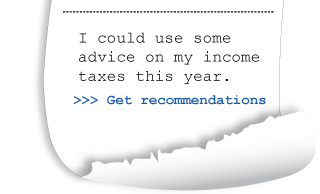 At Nanaimo Tax Services, we offer just the expertise you need. With more than 25 years’ experience in custom individual tax returns, personal taxes and small business income taxes, we know all the ins and outs of Canada’s tax system. Nanaimo Tax Services offers personalized service tailored to your specific tax situation. We use Intuit® ProFile™ professional tax software to deliver error-free results every time. Contact us at Nanaimo Tax Services and experience our personal, friendly service. We even offer a year-long guaranteed return and available follow-up service! Call now.